Staff front and back friendly, professional and know the answers. The vets and techs likewise are the very best. I have always been very happy with how I was treated and how my cats have been treated. Tonight there was young woman answering the phone. I believe her name was Holly. I was asking her questions about a puppy that was brought in by Denise Frisco. This young woman was so patient, informative, kind, and courteous despite my persistent questioning. Finally in a kind way, she told me that there were people waiting to be seen and if I could call back in the morning. This young woman’s professionalism, calm demeanor, and sweetness was very refreshing. In the nicest way, she asked me to call back and explained why. Pam & I want to say Thank You very much for the life saving work you did for our family dog Willie. He is back to 100 percent and is his old feisty self again. You guys saved his life, and we are so glad Atascadero Pet Hospital was there when we needed help. Thanks again. Thank you Dr. Matt & staff who were there on Sunday to take care of my puppy Ricco. He was a sick little boy. Everyone on call Sunday, (they know who they are) were compassionate, caring and professional. I think you all rock! Ricco is up & running & up to his little puppy tricks! Thanks again. I would like to thank everyone there, especially Dr. Cherbinsky for taking such good care of my Border Collie, “Kate”. He saved her a couple years ago, and I will never forget what good care she always receives there. Kate is my best friend, and we have done allot together, not to mention that everyone loves her. The staff is very friendly and professional, and deeply cares about the pets that come in. Thank you for being such a short drive from Paso Robles; don’t know what SLO County would do without you!!! Shiloh, who is 16 1/2, was unable to take more than 2 steps when I got home after work on Friday. We rushed right over and were squeezed in immediately. Everyone was sympathetic and helpful with my distressed husband as well. A shot and some rest and she was her old self the next day. 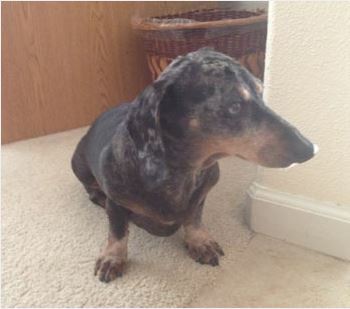 When I brought in Ranger, 15, today for a follow-up blood test, everyone asked about Shiloh. 3 different doctors over the last few weeks have either seen Ranger and/or discussed his lab work and medications with me and have been wonderful. Especially with two older dogs who continue to live large, Atascadero Pet Center is amazing. I appreciate the kind and professional way the staff answers my questions over the phone and it is very is easy to get an appointment. I also like the veterinarians that work there. They always deal well with my dogs and cat and don’t use drastic measures first unless it is absolutely necessary. They follow up with you and seem to take a real interest in our precious family pets. Thank you all for what you do for us. Your staff is wonderful. My dog Sophia was having a fight for her life and I so appreciate the clear explanations, diagnosis and what I could expect. In addition I found Dr. Hambright to be a warm encouraging person who put me at ease and gave me hope. Thank you all! I was very pleased with the care Apollo received in your facility. Dr. Polina kept me informed and I felt reassured and comfortable with Apollo’s stay, unfortunately Apollo doesn’t feel the same way, haha. The staff was friendly and efficient without making the client feel rushed. Thank you again for caring for Apollo. LOVE our experiences each and every time. Dr Schechter is so caring and loving and smart. Don’t know why it took us so long to make the switch. All of staff is awesome. Thanks for asking. Thank you for taking care of patch for me. Everyone is so nice at this place. I felt so reassured leaving him with you. Thank you so very much for your professional assistance for Bonnie Bea. I wouldn’t have it any other way! I feel blessed we found such a kind, patient, knowledgeable care provider. His extensive exam, evaluation, explanation of findings , and options of treatment plans is amazing. The hand outs he provides to take home and explain to my husband the findings is appreciated. In addition, following up on Bonnie’s progress by phone , and explaining results of blood work is reassuring . The convince of proper nutritional needs and “treats” to purchase at the Hospital is wonderful. Knowing we have a current treatment plan for our Bonnie shows us how we can enhance the quality for our Boston Terrier. Thank you once again for your 10 stars in excellent of service. I appreciated that as a “walk in” there was no problem treating Willie. 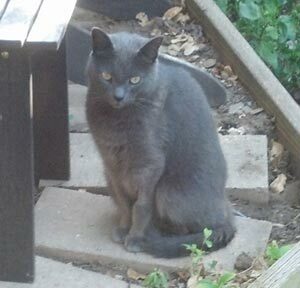 Since he came to our house as a feral cat eight years ago and has come a long way. Therefore we have taken the first opportunity to put him in the box and bring him to you for treatment. He is a wonderful pet for us and the two things he won’t do is sit in our lap or let us pick him up. But he loves to sleep with us! 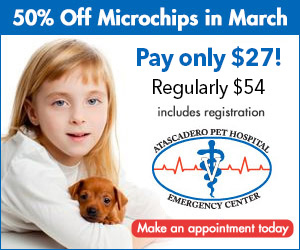 Atascadero Pet Hospital is top notch when it comes to animal care for your pet. They became our vet of choice after our pug had a massive tumor removed on Memorial Day. We drove to vets in Morro Bay, Los Osos, and Arroyo Grande before the vet in Arroyo Grande referred us to APH to perform the surgery. 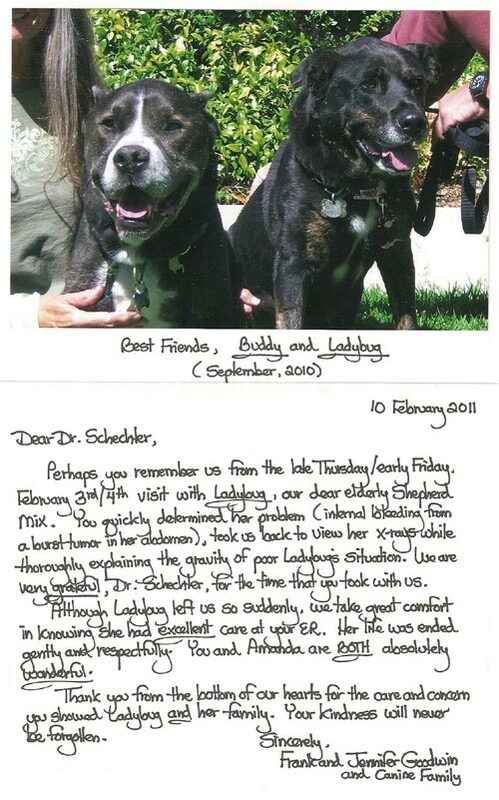 Although we live in Bakersfield, we prefer to make the drive to Atascadero to have both of our dogs seen by Dr. Matt. Even when they are busy, they do their best to get you in on the same day. They really care and have a great friendly staff. I cannot say enough wonderful things about this place. THE best care, so professional, caring, kind..to our dog and to our family. Our dog was very ill and is now doing just great! I am especially grateful to Dr. Burke but all the techs, doctors and front office staff are terrific. We are very lucky to have such great care available. I wouldn’t dream of taking my pets anywhere else and I tell everyone I meet how good they are. Thank you so much! Thank you so much for your surgical skill and your support of Bud, and me, during this past year. If I had the same choices to make again I wouldn’t do a thing differently. He was a trooper and we are thankful for the past few months, knowing it was all borrowed time. Last night it became clear he was not able to get up or stand after we lifted him up. Your Dad and the tech were so kind when we brought him back. He is gone, the sweetest and kindest dog ever. We will miss him so. You all made a difference! Thank you for your professional, caring and compassionate service today. The way you handled our dog, Corinne’s, case made her inevitable passing less traumatic for us, and less painful for her. Especially, the forthright & direct way you explained her condition and the options. Fellow dog and animal lovers, especially those who consider them family and would do anything to save them. Atascadero Pet center is an exceptional facility. I have been a loyal, grateful customer there for 11 years. Dr. Aaron Schecter, Dr.Matt Aaronion, Dr. Cherbinsky, Dr.Marby Hambright and all the vets and staff have saved the lives of many of my rescued dogs and cats. I want to share the most recent experience With Dr. Aaron Schecter and our beloved St. Bernard, Newfoundland, Holly Holy. My son and I took an 8 hour journey 3 years ago to redeem her from being locked in a muddy roofless horse corral by herself in the snow. She has a heart of gold and is my mentor. If I could be half the lady she is, I would be doing well. I truly would risk My own life to save her. She became lame in her hind legs and Dr. Aaron Scecter quickly found her knees to be misaligned. He recommended T.P.L.O. surgery to correct them Vets must have special training for this procedure. I was a bit reluctant for fear of losing her. I asked Dr.Schecter if she were his dog would he do the surgery and he said yes.I trust his opinion because he has performed successful surgeries on my dogs before. He also spared me from spending money on unnecessary treatments in the past. The surgery was a success.I had to do my part in the recovery process, and she came through remarkably well. Later her countenance fell and she appeared weak and lame on all four legs.She wasn,t eating well and vomited sometimes.I was dying inside certain I was losing her. Sometimes I couldn’t get her up with two harnesses.I mightily prayed at least a hundred times for her to be saved. I was a rubberband by the time I arrived at the Pet Center. Certain by then I would have to send her to heaven. I was terrified to get her out of my suburban it is high and she is huge, I feared she would collapse and fall.By Gods grace an army of vets and techs(angels to me)Including Dr. Schecter and Dr. Aaronion came to carry her out. Within less than an hour Dr.Schecter was able to diagnose her with Addisons disease.They kept her one night. I was able to pick her up the next morning and she looks and acts like herself.She is being treated and doing very well. I am eternally grateful to God for letting us keep her and to Dr. Schecter and every person that works at the Center for being so compassionate and hard working.The whole staff is full of kind,patient animal lovers just like us. God has His MIGHTY hand over them for sure.I am so blessed to know them and have them available for my best friends.Obviously I higly recommend The Atascadero Pet Center.They have successfully treated rattlesnake bites,emergency surgeries , broken bones and many other ailments of my animal friends. My animals will be happy patients their for the rest of there days upon the earth. We have wanted to thank you much sooner for your caring and tenderness towards us and our dear dog, Blue, on May 10, 2013. It has been difficult to finish a thank you email as it still feels so unreal that he is gone, and so final. We miss him so much. 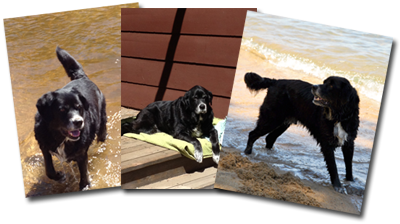 We hope he is in a better place somewhere like Lake Tahoe where he loved to sit on the porch, swim in The Lake and chase any critter that moved. We wanted you to see Blue when he was well & healthy so have attached a few photos. Although our visit to San Luis Obispo was saddened by loosing one of our family, there must have been a reason we were lead to your excellent facility with all of your efficient care, advice and sympathies. Thank you so much for your attention to our elderly and very challenging cat, Mattie, this week. We know that you all delivered the very best care and worked in her & our best interests with compassion for the owner & pet. Last month we brought our cat Oso to your hospital. He was very ill, and you saved him. He is doing great now. He is back to running the house with an iron paw. I wanted to let you all know how much we appreciate what you did for him. Oso (and all of our cats) mean everything to us. He has been with us since he was just a few days old. I have attached a picture of him, he is back to his daily task of helping me water the yard. Thank you again, God Bless you all. Thank you so much for treating little Hugo’s leg. We wouldn’t still have him if it wasn’t for you. We love having him in our lives and hope for many happy years ahead. He seems to be healing well! Have a great holiday season! I wanted to especially thank you for your honest opinions and expertise, without that I probably wouldn’t have had done the surgery on Maddie. You did a great job and I can’t say thank you enough. I now get more time with my doggie. I appreciate all that you and your staff has done for us. I sincerely thank you for the many hours you spent really caring for (and about) Heidi….The nice, calm & loving way you helped her leave our world made it bearable. I will always remember your kindness and how much you cared. Thank you for taking such great care of our Chloe. She recovered quickly and is our silly little girl again. Thanks for answering all my questions and helping me make the choices. You are very kind. Thank you for the love you gave Angel & the good service. She’s doing well. We cannot express our overwhelming gratitude to you for saving Lucy’s life! Your diligence for finding a cure for our puppy’s pneumonia was nothing short of a miracle. You have made our family very happy! Lucy is extremely thankful too! My name is Melanie Lightfoot and our dog was Daisy Mae. We had to put her down a couple of weeks ago after seven months of knowing she had bone cancer. With medication she was great up until the last 48 hours and then she made it clear to us that is was her time to go. The staff at Atascadero Pet Hospital was wonderful in our time of sadness and need. Losing our fur babies is one of the hardest things we humans go through. I picked up her ashes yesterday and staff was once again compassionate and kind. Late last night our old cat Humprhey had taken a significant turn for the worse and it was clear he needed to be put to rest. Thank goodness the Atascadero Pet Hospital exists, else we would have to watch our little friend suffer through the night. When we arrived at the facility, we were greeted by friendly staff and Dr. Hambright who had previously seen Humphrey months earlier. It meant the world to me to hear Dr. Hambright words of wisdom, both the facts of the situation and her obvious sympathetic ear. Even during difficult times, you guys and gals are truly the best and it does make a difference. Please accept my gratitude for all of the work you do on behalf of our pets. My Banch had a bad cough at night and now is almost gone, she is feeling much better and appetite has come back in full force. We are now out walking and having fun in the vineyard. Your staff is always awesome, kind, on top of everything. We love you for all you do in the pet world…people world too! We wanted to thank all of your staff for saving our dog Surf! He is completely back to his old, happy self. My children are so grateful. I brought Addie into you this morning nearly dead. You all responded so quickly & professionally and saved her life. Thank you for treating her and myself with respect and care. I made you cookies since that is how I can say thank you. Thank you for all the calls & your care. This letter is to express my thanks and gratitude for the kindness and professionalism that we experienced recently at your facility. Our precious little Belle was seen by Dr. Bob on June 17th  because she was not eating or responding well after a surgery she had earlier that week. Dr. Bob was so patient with us as we struggled with the decision to hospitalize Belle and see if she would respond to treatment. His level of knowledge, honesty and professionalism that evening was very much appreciated. The following Sunday, on returning to the hospital, we met with Dr. Cherbinsky. Again his knowledgeable recommendations added to his level of empathy made our decision and the process a little easier. He was very kind and words cannot express how much I appreciate the manner in which he allowed us to say our goodbyes. I could never have imagined it would be such a beautiful day in such a beautiful place. Please express my heartfelt thank you to Dr. Bob, Dr. Cherbinsky and the staff at your hospital. Just want to thank you for all the wonderful help you all have given for the care of our pets! Every time we have needed your help, you have responded with compassion, professionalism & care. You are the best! We can’t thank you enough for the loving care you gave Bristol and for working with us and all my phone calls to you during the difficult time of her failing health. You have a fantastic staff-very kind and caring. They are all very much appreciated. For all the loving care you gave to my precious baby Bradley. Everything is empty without his kisses on my nose & his soft, soft hair & his warm little body next to me in bed. I really do believe that he hung on those two extra weeks for me! Because he didn’t want to leave me alone. During that time I felt so at ease, knowing he was being looked after, & more importantly, genuinely ‘cared for’ with you all. Thank you for the times you allowed me to visit with him for many hours sometimes, that helped both of us I think! You are kind and caring people. Thank you. Sam was loved and special to us both. Your staff helped make his passing much more easier for all of us. Sam is whole & pain free now with all of your helping hands and big hearts. God bless every one of you here. Just a quick notes to let you know how grateful I am for you and your staff who treated my dog Markus on the evening of March 7. Markus was experiencing Bloat and you prevented a horrible situation from getting worse. Markus has been fine since then and back to his wonderful self. Please also thank your assistant Ashley and another young lady who worked with you that evening. Click here to view the puppies then and now. In this season of Thanksgiving, my heart is full of gratitude and joy because of everything you and your colleagues did to save my dog Bear. “Compassion for animals is closely connected with character type. You can say with confidence that he who is kind to animals is most likely a warmhearted person.” -Arthur Schopenhauer.